Can anyone provide some tips on the cheapest/safest way to either check a ski on a flight or ship a ski? I am heading to Florida in a couple months and would like to get some skiing in, but I am not willing to pay $175 per way to check the ski. I am thinking of maybe shipping it, but I am not sure if that makes sense. Does anyone have any advice? USPS- 5+ days ahead of time even cheaper. Make that the big fat bubbled bubble rap. Also recently shipped a blank ski to Canada. With no boots, no need for a square tube box. Separated box. Folded one side in on itself and made a triangle tube box. Stronger and when measured by USPS it was cheaper as the measurement of the circumphrance was 1/4 less. Your way the ski is touching the inside of the box. If you pack a square box right the ski is suspended inside. I think that is safer. A triangle is MUCH stronger than a square. The biggest problem I see with shipped skis, is not enough padding for the tip and tail/fin. Sometimes, the tip (or fin) is poked through. @danbirch I understand that but if the bottom of the ski is on touching the side of the box and the box is dropped... the bottom of the ski is basically hitting the ground. With a well packed square box the skis is suspended so the skis does hit the ground. @Horton, agreed. It is always important to wrap the ski with foam. Also, it is critical that there is NO movement in the box. I am amazed at how many skis I've seen come, in oversized (rectangle) boxes, and the ski is floating all over the place in there. The biggest problem (IMO) with the shipping companies, is they toss other boxes on top of yours. That can create a "fold" in the square box, and depending on what they threw on it, it could be bad. Also, hard throwing of the boxes causes the ski to shift inside the box, and sometimes makes the fin or tail, or tip jam through (as previously mentioned). most of the ski companies have a card board piece at the tip and the tail of the ski. If you assemble right the ski is floating in the middle of the box. No foam needed. That's very cool. I've bought the last few skis on SIA, and maybe they don't save those pieces. They would be critical to the safety of the ski. Just used this to carry 4 pair nordic skis and poles overseas. Wrapped them with clothes and no damage. Could easily haul a slalom ski wrapped in your clothes and anything else you would want to pack as protection. Carry on the bindings or check in another bag. No charge for the checked ski box. Many airlines take water skis at no additional charge. Who are you flying? @Horton. Respectfully disagree. Ski was suspended in the triangle box by being completely rapped in bubble rap (big bubbles) tip and tail rapped in exta. Fin still on fin block removed from ski and tucked between 2 pieces foam which was tucked inside. Wadded paper at each end so no movement. Soooo much stronger than a square. Try setting another box on top of it. Just slides off. My guess is it will end up on top of any stack of boxes being shipped. And I reduce overall size of the box by half.....literally!! Big savings with USPS . FedX would only consider it to be a square.... What??... After explaining that the box is half that size, the representative at the FedX store finally shrugged her shoulders and said, and I quoate " We weren't taught to measure em like that". Useless to argue with that level of education. I shipped 5 skies in the last 6 months The last, a triangle, was far supperior to a square box hands down. Ive seen some boxes to small to do this with. Gotta be a square tube or close to it to make it a triangle. From now on, any ski I ship (without boots) goes in a triangle box and shipped USPS unless asked to do otherwise. I've used my Sport-tube on planes and they always have been seen as or eqivilant to snow skis and I paid or didn't have to pay accordingly. If checked curb side with a tip it rarely gets measured and sometimes not even weighed. Shipping is always measured as a square. Widest width, tallest height. We ship (and receive) a lot of boxes/products that are narrow and long. Never have a problem with the triangle boxes, but seen a lot of problems with the square/rectangle ones. They just aren't that strong. I a flying on Delta. 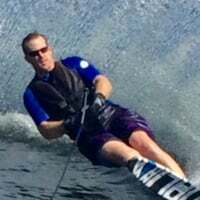 Anyone have experience with checking water skis? They do not have a separate category for them, so I just assumed they would fall into the $175/way oversize bag category. This seems dumb considering how light they are. Any help would be greatly appreciated. I'd love to be able to check it rather than ship it. Delta is supposed to let you fly a ski for free, as checked luggage. Here is their rule that applies to snow skis, and I'm pretty sure it would apply to water skis as well. If you are hitting the slopes, you can bring your ski and snowboard equipment as checked baggage. One ski/pole bag or one snowboard bag, and one boot bag is accepted per person (and counts as one checked bag). The combined weight of the ski/snowboard bag and the boot bag may not exceed 50 lbs. (23 kg) or excess weight charges will apply. Linear dimensions may exceed 80 inches (203 cm), no excess size charges apply. All standard baggage charges apply. " I would recommend printing their policy (on their website) and bring it with you, in case the teller is not aware of this policy. The only time I had to deal with extra cost on the sport tube was one of the first times I used it. I kept cramming stuff in it (around the ski) so I would only have one checked bag. Went over the weight limit. Ooops. USPS measured length X circumphrance. So my triangle box took 1/4 of the circumphance measurement out of the equation. FedX sees it as a square regardless. Can only assume UPS does the same. Hi I have been traveling down there about 6 times a year now for two years. I purchased a Sportube for $140. The airlines right now charge about $20 each way(tell them it is skis not H2O) as long as you keep it below 50#. I have my vest slalom ski in a ski tog and my trick ski in a tog with one rope, one handle and a shortie wet suit inside=44lbs. Good luck and have fun it is always great to ski when all your friends are back home are freezing! Thanks. Where do I find a sportube? So even if you are traveling somewhere warm you have gotten away with telling them the sportube contains "skis" and just don't clarify that it is a waterski even if you are going somewhere warm like Florida? With a TSA lock, I assume they inspect it after you check it but the person checking you in does not look inside to see it is not snow skis? Thanks. Google sportube. I think over the years I've said both waterski and just skis. I live in FL and have not had any issues. I just looked. Will a slalom with bindings on fit into either of the smaller "alpine ski" sportube's? I like the idea of being able to fit it into the passenger area of a regular size rental car and the sportube 3 looks pretty big for that. Any thoughts? Is there anything special in the sporttube 3 that is water ski specific, or is it merely a function of size? How do you go about packing the ski inside to protect it (i.e remove fin or bindings)? thanks! A water ski will not fit into a regular sport tube with bindings and have enough room for extra padding. I have not used the waterski specific tube. It is easy to wrap the skis with clothes for padding. We did fit 3 full size (4 pair of skis) tubes into a hatch back rental car with the middle seat folded down along with ski bags etc. In my opinion no better way to put skis on a plane worry free. Mine is a "Goode" Sportube. Only diff is Goode slapped their stickers on it and charged more. Empty cavity inside. I use life jacket and cloths for padding. Fin Firkin for my fin.